the Software Marketing Glossary guy from DP Directory, Inc.
Kenneth Gronbach writes that Detroit's economic woes are caused by the automobile manufacturers not paying attention to the demographics of buying cars. Gronbach is the author of the book "The Age Curve – How to Profit from the Coming Demographic Storm." Gronbach's book looks at the marketplace from the perspective of demographics, and delivers insights that can help all businesses, including microISVs. In the US, men aged 43 purchase automobiles. Okay, men aged 33 to 53 are the heaviest buyers of vehicles. Generation X (the 69.5 million Americans born between 1965 and 1984) can't buy cars at the same level as Baby Boomers (the 78.2 million Americans born between 1945 and 1964) bought cars because there are nine million fewer people in Generation X. Simple demographics dictates that fewer cars will be sold as the Generation X buyers replace the Boomers as car buyers. Toyota, Gronbach explains, has figured it out. Instead of mainly targeting traditional buyers, Toyota crafts cars that attract the much larger group of young Generation Y buyers (the 100+ million Americans born in 1985 and later.) Toyota took the time to study the types of used cars that young adults are buying today. And Toyota built new vehicles that are attractive to these younger buyers. Gronbach talks about an advertising campaign from Porsche 20-or-so years ago. Porsche of America encouraged prospects to buy used Porsches. Even though this didn't create an income stream for Porsche at the time, the company depended on the sale of used Porsches to sell new ones. By making the market for used Porsches strong, the company increased the trade-in value of these older automobiles. Many people traded in their old Porsches for new ones. There is no doubt a lesson here for microISV business owners: Perhaps it's time to give your software to college students without charge. And to high school students. And to educators. Plant the seeds today with users who don't have the disposable income to buy your application software. When they graduate and find jobs, they'll remember how great your software was, and buy it. And they might encourage all of their business colleagues to buy it, too. To succeed in business, all you need is a steady series of small, incremental changes to your products and services. So says Phil Dusenberry, the former chairman of BBDO North America, one of the largest advertising firms in the US. There's no need to make the sales needle jump, Dusenberry believes. You just need a steady flow of small changes to succeed. Dusenberry explains his business ideas in his book "Then We Set His Hair on Fire." The book title is a reference to BBDO's creation of the Pepsi TV ad in which Michael Jackson had an unfortunate accident. There's a fascinating story in the book about one of these small course-correction changes. I believe that the story is instructive to those of us in the software industry. Dusenberry's company landed the Campbell's Soup account in the 1980s. Soup sales were stagnant. So BBDO did some serious research, and learned something unusual - lots of consumers had cupboards full of Campbell's soup. Campbell's Soup had been advertised for decades as a safety-related product. It's virtually non perishable, and you need to keep it in the house for health and medical emergencies. Campbell's Soup ads urged people to buy cans of soup for their cupboards. Oddly, there was a major disconnect between the purchase rate and the consumption rate for soup. There's a similar problem with try-before-you-buy software. 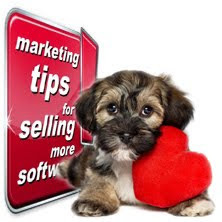 Most software companies tell their prospects, over and over, that they should download their software. Lots of people listened to both the soup and the software messages, and acted on them. They filled their cupboards with cans of soup (but didn't eat very much of it.) And downloaders grabbed lots of software trial versions. But about one hundred times as many people download software as buy it, so the "download" message (but not a "buy" message) is being read, understood, and acted upon. How did Campbell's solve their problem of flat soup sales? They changed their ad campaign to stress the benefits of consuming soup, and not just buying it and storing it for emergencies. The new tag line was "Reach for the Campbell's. It's right on your shelf." People started consuming the soup that they had bought. What might software developers do to get more people to buy the software that they've downloaded? The simple answer is to urge prospects to buy your software rather than nudging them to download it. The success of this approach depends upon the type of software that you offer, and the audience that you target. For example, if you're selling programmers' tools, then your target audience is very comfortable downloading, installing, and experimenting with software. In fact, most programmers would be reluctant to buy any software without trying it first. By contrast, many home users will buy software if it has been recommended by an expert. It's possible that testimonials and recommendations can get many prospects to bypass the "try it" stage, and move directly to the "buy it" action. For most software developers, there's no way to reliably predict if their prospects might be amenable to buying the software before trying it. The only way to know for sure is to experiment. Document your current sales levels. Change your sales presentation to emphasize sales rather than downloads. And measure sales again. Be sure to think through your support workload. If you have an application that's targeted at tech-savvy users, and you convince a significant percentage of non-tech prospects to buy your software without trying it first, you may find yourself on the phone providing support to people who don't have the technical knowledge to use your software. Another simple solution to getting more software sales is to create a one-page instruction sheet that downloaders can print and use as a reference. Such a sheet can help prospects overcome a lot of the problems that discourage them from buying your software. Start your Instruction Sheet with a date/time stamp, followed by a description of your Widget software. Say something like, "Thank you for downloading Widget, the Windows powerhouse that saves you time and money every week by doing this and that." This will remind users why they downloaded your software in the first place. People are interested in security. Say something like, "Widget is safe and easy to install. In just a few minutes, you'll be saving time and saving money with Widget." Next, rekindle their interest in your program by reminding them of the most powerful benefit that it delivers.. Include a quick-start guide for experienced users, and detailed instructions for newbies. Tell them the name of the download archive. Offer a coupon code that they can use in the next 72 hours to buy the full version of your application. Make your Instruction Sheet easy to print. Don't expect people to open a .DOC file. To sell more software, microISVs need to address each of the decision points where consumers are dropping the ball. And by encouraging downloaders to print your instruction sheet, you could substantially increase sales. Some prospects download and forget about your application. Absent some type of trigger, they're unlikely to locate the download archive and install your application. By encouraging prospects to print an instruction sheet, they'll have a hard copy reminder to install it. One mistake that some developers make is naming their download archive something blah like "setup.exe". Even if a prospect remembers to look for your installation file, they may find it in a folder full of .ZIP or .EXE files with names that won't help them remember why they downloaded your trial version. Use a meaningful name so prospects will be able to find the program after they've downloaded it. Some people install the trial version, intending to try it later. And they forget about it. Or when they try it a month later, the trial version has expired. Having a printed instruction sheet can remind them that they've installed a new application, and that they need to give it a workout. Many developers do not provide a quick-start guide, a library of tips of the day, or easy-to-find sample files that can get their prospects using the software quickly and easily. Prospects who have downloaded and installed your trial version run the program, find no obvious place to click to start using it, and abandon the software in frustration. Finally, some developers don't use persuasive registration incentives to convince people to buy the application. This results in people using the trial version, but not purchasing the full version. It's not easy to create an effective registration incentive regimen. But the payoff can be great. By identifying every decision point where users can either buy the application or not, it's possible to find simple ways to entice them into making a buying decision. Some of these changes might be as simple as Campbell's Soup urging their customers to eat the soup that they had previously been stockpiling. Maybe it's as simple as urging downloaders to print your instruction sheet. Visit the Software Marketing Glossary for feature-length articles and fresh marketing ideas to increase your software sales. © 1997-2016 DP Directory, Inc. All rights reserved.